Contaminates build up inside the return ductwork. 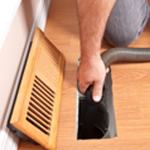 Traditional heating and cooling systems recirculate the air in a home via supply air ducts and return air ducts. Many homes have inefficient filters, which trap less than 10 percent of the particulate that is circulated in the system. If not trapped by the systems air filter, the particulate accumulates in the duct work and on the internal components of your furnace or fan coil. Safeguard your health by eliminating potential causes of allergies and respiratory problems. Eliminate the dirt that acts as food for dust mites, bacteria, mold and other micro organisms.